and if there are any questions at all, THIS is the place to ask. scribble these down in an Art Journal. GET READY to be CREATIVE!!!!! CHAW - 2012 - DAY ONE! Hello my lovelies!!! Well, here it is 1:30 (ish) in the morning, and it has been a VERY long couple of days here in S. CA so far! The 2012 CHA show is finally under way, and I have got a LOT to show you, so grab your cuppa Joe (or whatever it is that fills your mug) and follow along! Anyway - got off track there.... While visiting with the beauties at Prima (Pom, Shannette, Adam & Porfi) I had the rare and very special opportunity to meet with Miss Anna Dabrowska, better known in the scrapbook world as Finnabair. This woman is absolutely SUCH an incredible artist! Her clustering techniques are known all over the world, and I was fortunate enough to sit in on one of her classes! 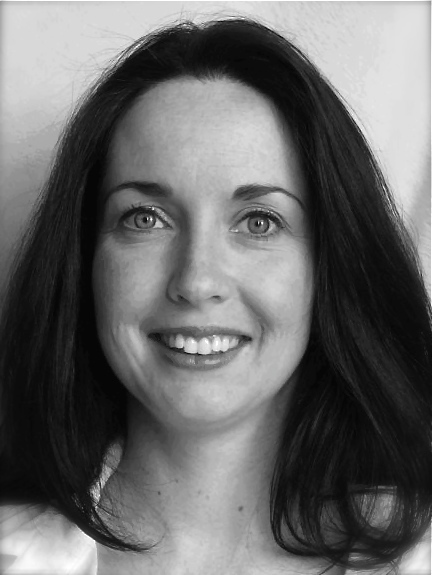 Anna is such a kind and attentive instructor, always taking great care to ensure that each of her students receives her attention, and has a complete understanding of the technique at hand! 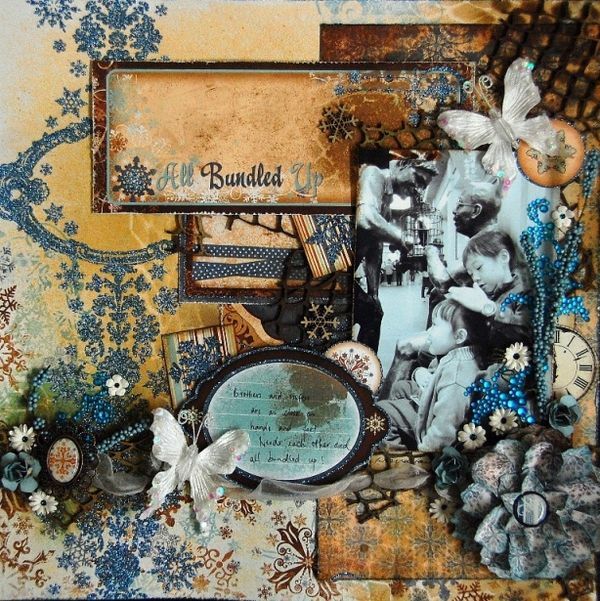 With Anna's expert guidance we were able to create a wonderfully fantastic grunge layout! I always love to look at the new art pieces on display at CHA! 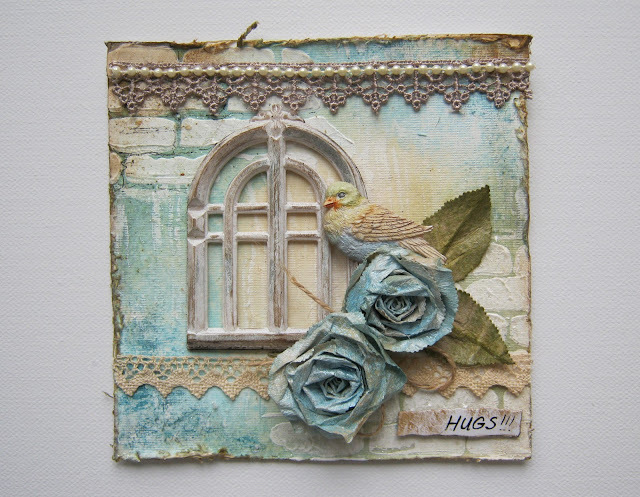 I am always so inpsired after being in the company of such amazing artists as Donna Salazar - who's new Chipboard birdhouse is pictured below. If you've ever had the pleasure of attending a CHA Show, you are aware of just how elaborate some of the displays can be! Well, for this show - DCWV did not disappoint. Below is a tree located in their booth. Beautifully appointed glass bowls adorned with beads and gemstones were lovingly hung from it's branches. This sucker was GORGEOUS! I MUST figure out where they purchased those bowls! Also in the DCWV booth, were these equally impressive and GORGEOUS displays made from DCWV paper lines! And here is one last display goodie for you. This beautiful dress was on display at the Connie Crystal booth. The entire ensemble was created from paper and crystals! That's all I have time for right now guys - but I got my NIKON working (yay! no more cell phone pics) so I'll be scouring the show getting the good shots of the good stuff! I'm off to DAY TWO! To make fresh start and wear a broad smile. As starting again with a mundane new name. Perhaps a new face, not of a beauty queen. Who I am or once was, or the name that I bear. Is where I'll find a new beginning for me. I'll set up my shop and have a new home. Forgotten I'll be, no one's calling at last. On pillows so sweet, downy and soft. And yesterday's sorrows aren't welcome within. Oh, how I wish I could always be there. Without fans and cameras and pundits replete. To see what today awaits me there. Today I'll dance, tomorrow I'll stroll. New beginnings and tomorrows will always be there. and join me for awhile!!! Technique Video....oh the fun we are going to have! 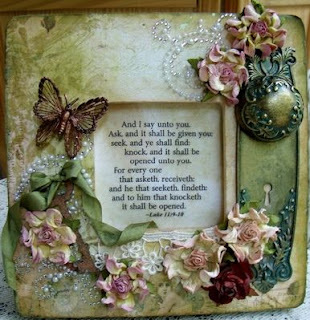 How about.....a bit of Canvas....some Beeswax......a Handmade template and some Petaloo Flowers! 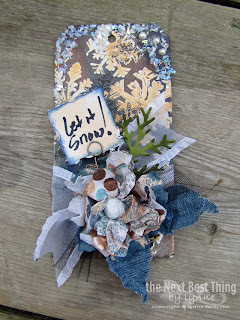 This is the little ditty I created........and you can toooo!!! Kraft Resit Paper ~ or whatever you would like to use for you card! Lots going on right now over on the boards! First CHA. WooHoo!!! Our fearless leader, broken foot and all, are headed to CHA to gobble up as many of the latest and greatest goodies for our subscribers! She has our wish list in hand!! Good Luck Krissy! Hope you post some photos!! Our Education Team has been working on some future planning and supply lists so we can make sure to have everything in the store for you so you don't have to go hunting and fishing around all over to get what you need. Speaking of the Education Team, there is another ULTRA fabulous video tutorial coming your way tomorrow...HERE, ON THE BLOG! We also have some product reviews heading your way as well. The DT is waiting for their February kits. Hopefully they will have that super gorgeous box of inspiration in their hands in the coming week. Make sure to check back here and on the forum for our Blog Hop date announcement. You can subscribe to us by email, or just stop back frequently and check the list of events over on the right. It's always nice to have MORE Christmas stuff- perfect for getting a hop on next year's cards! The vintage feel never goes out of style! 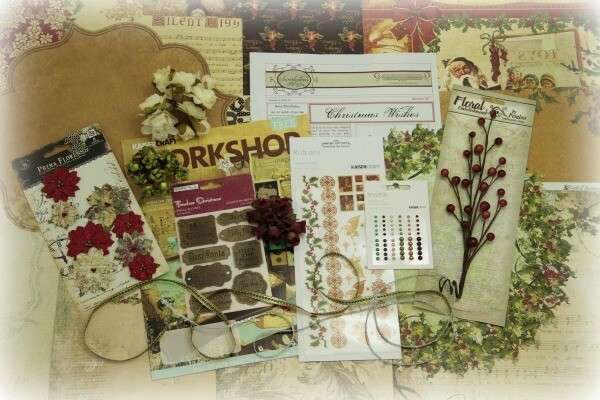 The paper in this kit is wonderful, but if it doesn't fit your home decor, you could save it and use paper that does! 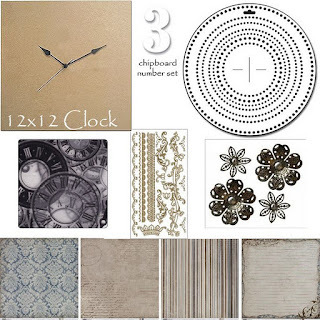 And, there are soooo many Maya Road clocks in there- all sizes! 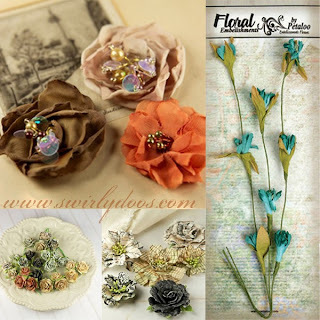 These flowers went fabulous with the Rendezvous kit, but they are so versatile, they will go with nearly every project you make. And, for only $10! Grab your 2011 kits at half off soon before they are gone! This month, like every month, we have such awesome entries for our challenges here at Swirlydoos! I'm always amazed at the level of talent on our boards, so I thought I would highlight what's been happening. 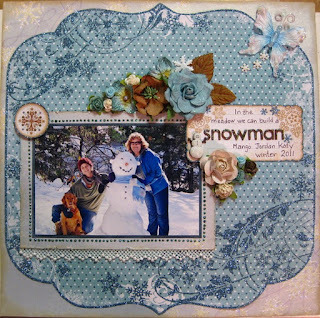 First off, January's Round Robin challenge is complete, so don't forget to vote! Thank you so much for hosting this month, Tracey! The SGC (Swirly Girl Challenges) are wrapping up, so if you haven't got your entries in yet, DO IT!! What a great moment to capture! Lovely design too! And, I spotted this beauty by Linda. She made this for the "One Word" challenge! 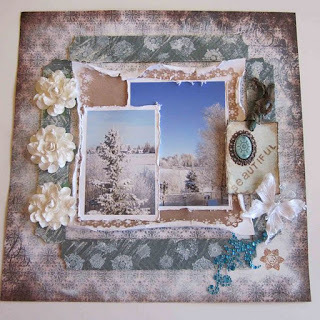 Barbara did such a great job with the Mystical Winter Sketch Challenge. Just look at those leaves! So, keep those entries coming, ladies! 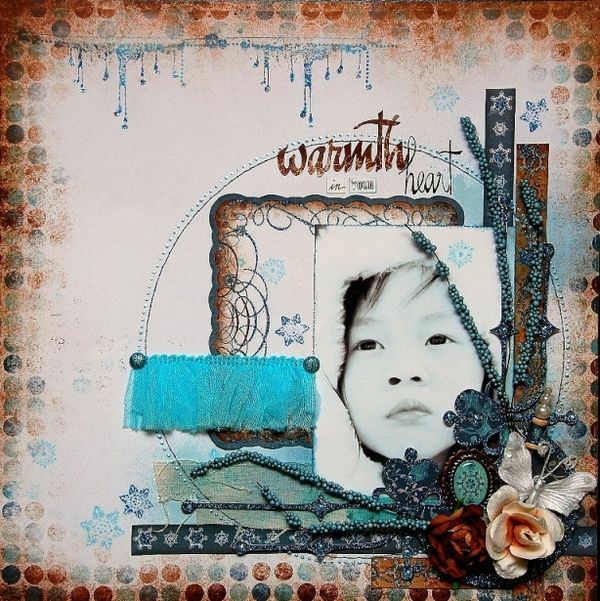 To warm you guys up for our Card Adventure, which starts next Tuesday, January 31st, I created this card, Featuring ET member: Lynne's *Stenciling with Gesso* technique. I hope to see you all next week, when the Card Party is starting!!! 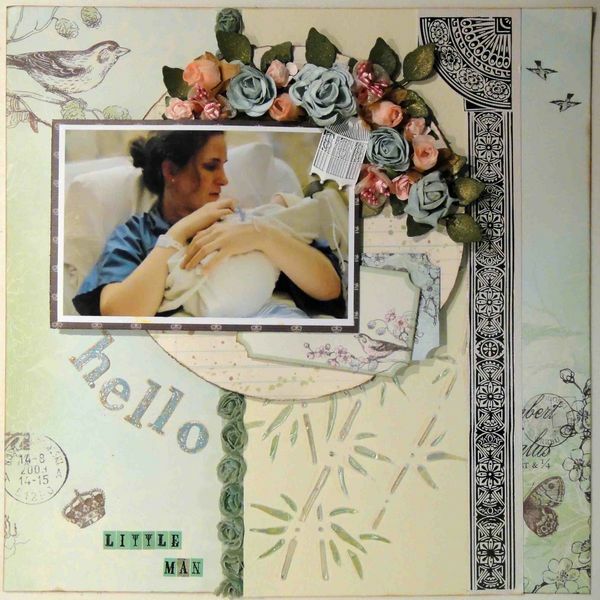 Lisa has created a beautiful LO of her sons family. The colors compliment the photo beautifully. Just about all of the embellies were hand crafted by Lisa. 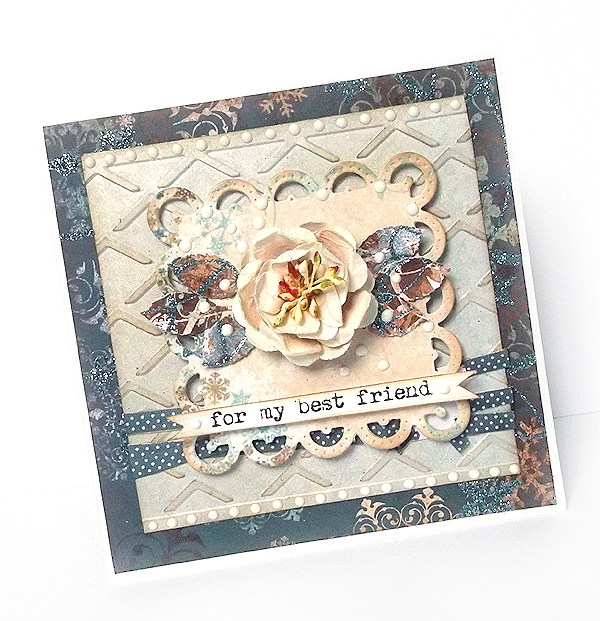 The flowers, the leaves and all of the distressing. There is stitching and layering. 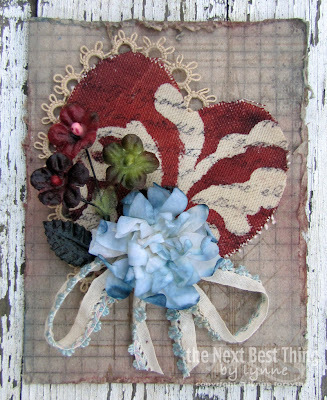 Then there are the little unexpected surprises like the butterfly peeking out of the peek a boo torn paper on the edge and the lace and trim tucked into here and there. Just beautiful in every was!!! 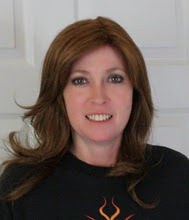 Go visit Lisa's blog for closeups and details. January Technique kit. Canvas tutorial. It's me Tiffany. 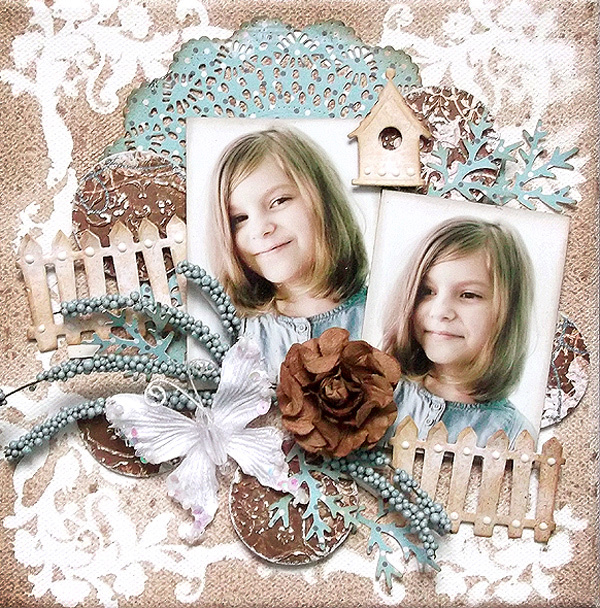 I had so much fun making this layout. 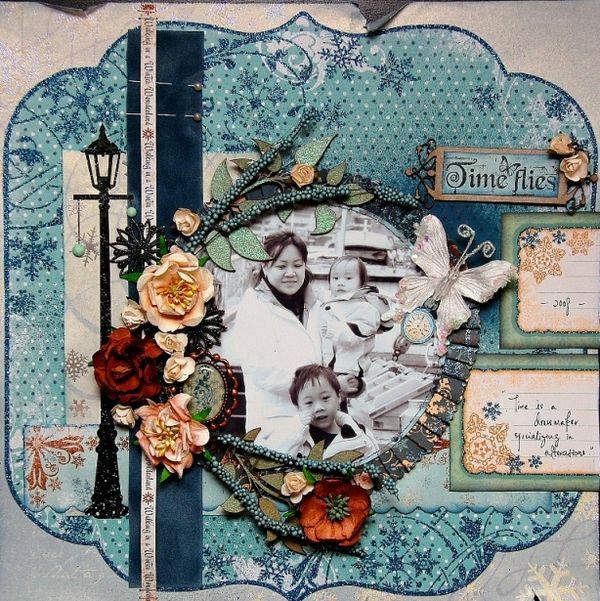 I used the District Market canvas that is in the January technique kit. You can purchase the kits at Swirlydoos. In the video I use a tag i made using some techniques found in this video tutorial here. 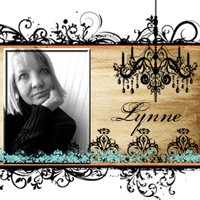 If you missed any of the video tutorials from myself or Lynne you can find them here. Make sure you subscribe to the channel. If you have any questions please feel free to ask. You can comment here or you can always find me on the swilrydoos forums here. Happy Friday!! In case you didn't know, we have changed how we reveal our monthly projects. 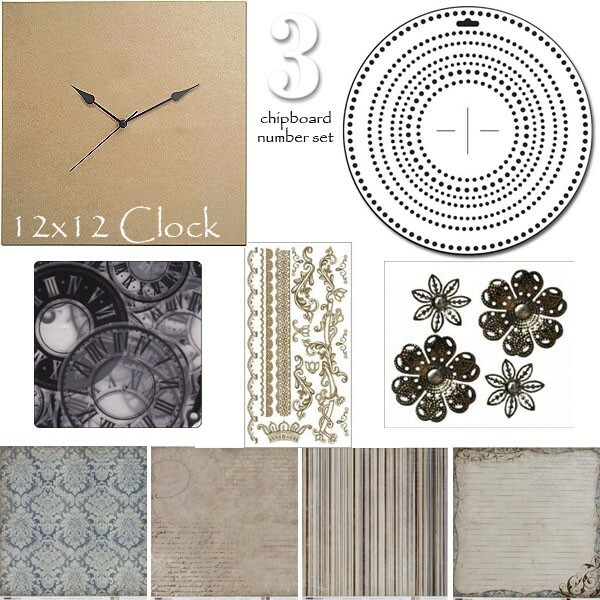 First, we have a really, really big blog hop and then our designers will reveal the rest of their projects little by little for the rest of the month! Take a look, and try not to drool, at the amazing work Irene did with our January kit. We're aren't done yet. 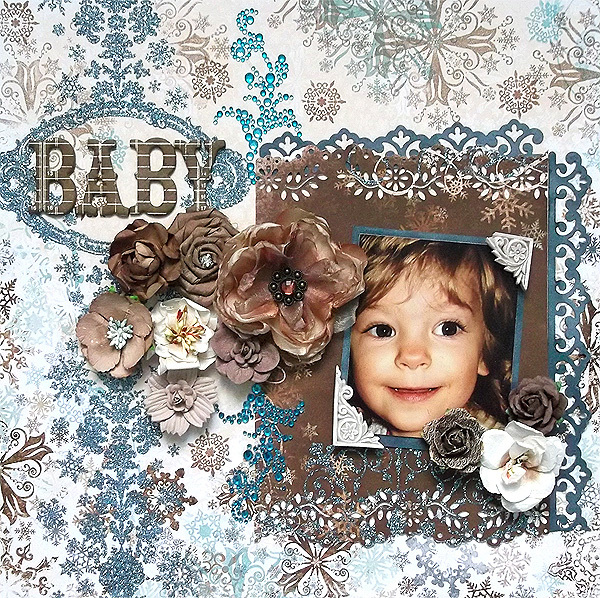 Take a look at all of the gorgeous projects that Karola created with our January kit! I'm guessing that right about now you are full of inspiration and knocking people out of the way to get to your scrap room. I'm right there with ya!! For even more inspiration take a look in our gallery and come visit with us in the forum. We have a brand new design team member!!!! Personally, I am so excited to FINALLY be working with her. We have stalked each others blogs and online galleries for quite some time. Please welcome our fourth International Designer, Vicky Alberto!!!!!!!! Welcome to our crazy Swirly world Vicky!!! Have a beautiful winter weekend!! New items are slowly but surely making their way into the store! 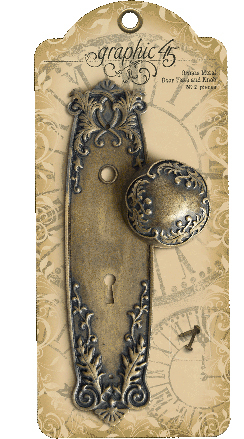 This week, I want to share my favorite new product to hit the Swirly shelves: the Graphic 45 Ornate Metal Door Plate and Knob. What a perfect piece of symbolism for so many inspirational projects!! This is a beauty! 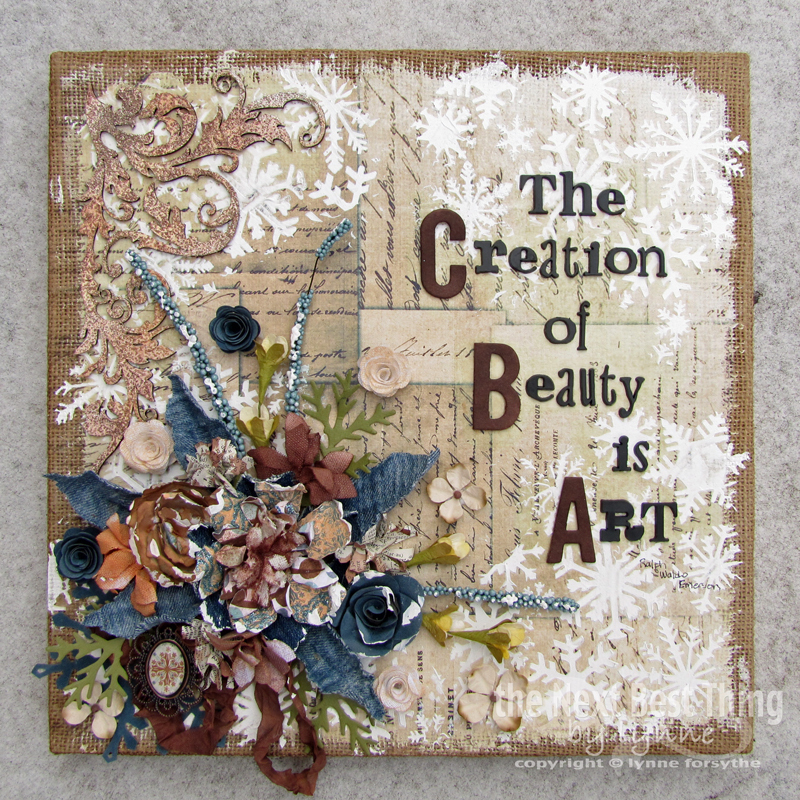 Thanks for sharing your art with Tracey! Go to the Swirlydoos store and get yours today before they are gone! 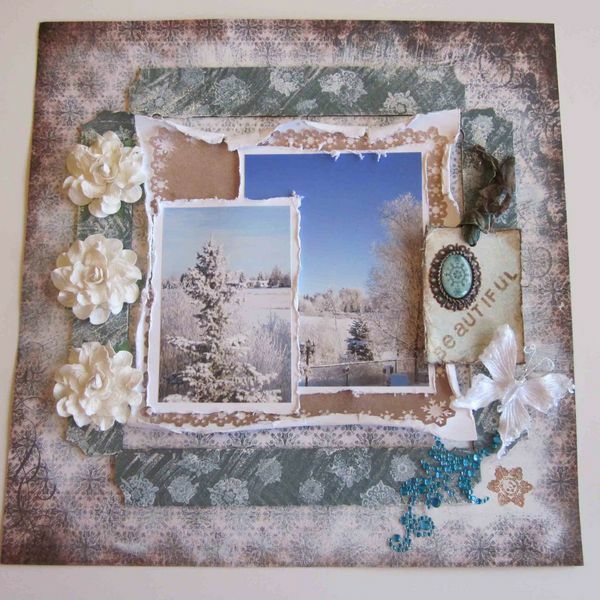 We had some amazing entries in the December Challenge. It's always so hard to just pick two. These winners just took our breathe away!! Congrats girls!! 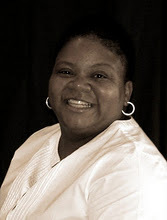 Peggy is our Swirly Siren this month. The DT loved Peggy's amazing ghost stamping. 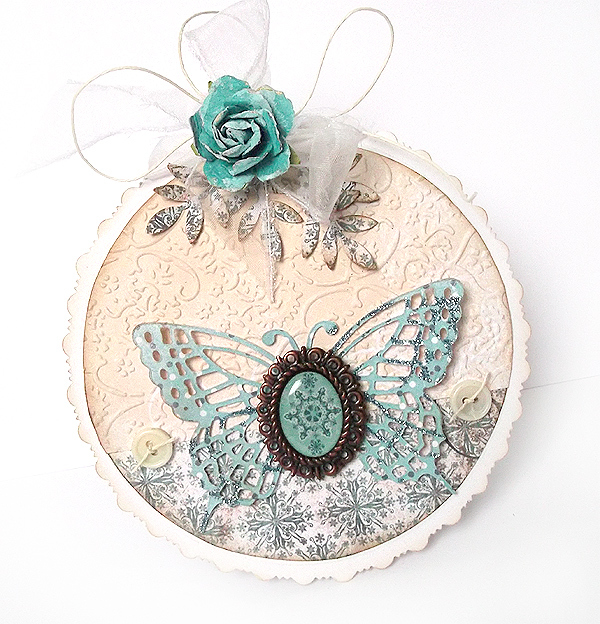 She followed Camilla's Mica Chipboard tutorial using Lindy's Magicals on the trees. Fabulous work Peggy!!! Cheryl is our Betty Blue. How can the DT not pass up that sweet photo!! She used Lisa G’s puffy poinsettia tutorial. Just look how gorgeous those flowers are!! We are having a Question and Answers thread now, which can/will be very helpful. 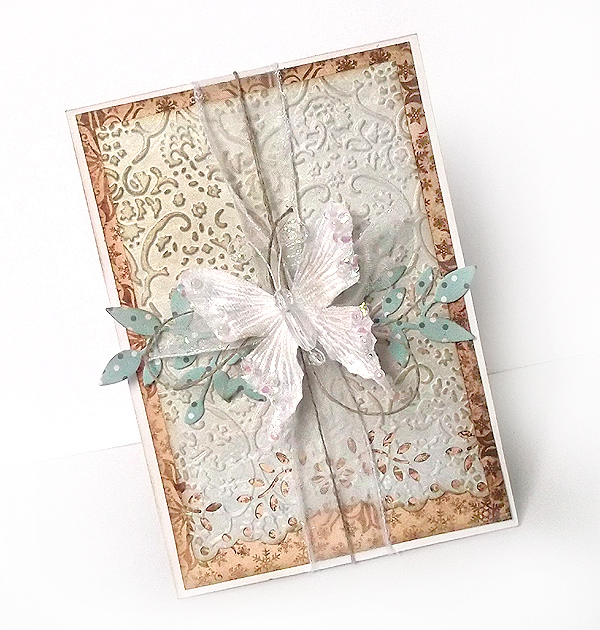 Also there will be a monthly Live Chat, where we can talk all about making cards. Oh My Word!!! You hoppers are amazing! Krissy and the members of the Design and Education teams were blown away. You are all so sweet and made us all smile! So, from the bottom of our scrappy little hearts, THANK YOU!!!!! Now...on to the winners! YOU HAVE 7 DAYS TO CLAIM YOUR PRIZE!!!! Please email Lisa@swirlydoos.com with your name and mailing address. She will contact the manufacturer and have the prize sent to you. Congratulations ladies!!! Thanks again for spending time with us on the hop and we hope to see you around next month!! 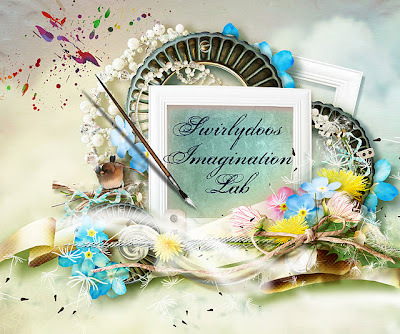 Make sure to stop into the Swirlydoos forum and see what's going; challenges, chat, tutorials....tons of fun stuff. We would love to have you. Wow...All we can say is wow...Now this is a tag!! Well, actually it's a name tag!! Kathi belongs to a local group called All Things Tim. One of our projects was to make a name tag..This is Kathi's. It is an ATC, all decked out with a pin on the back. The detail is amazing!! 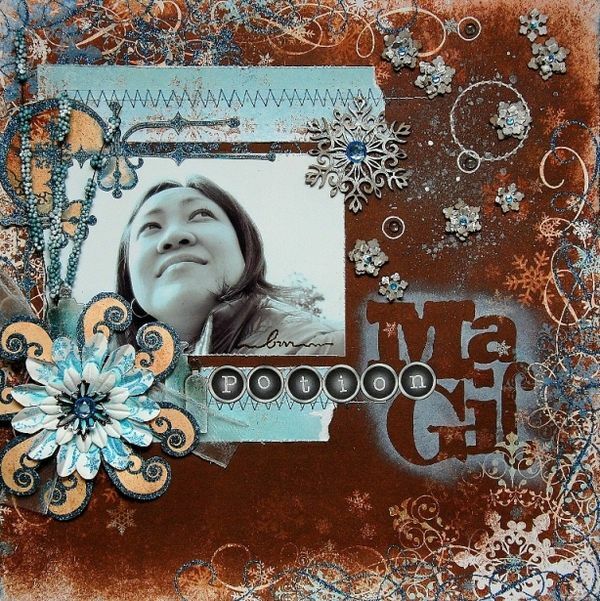 The embossing, the metal pieces, the wonderful inking. We just adore the way Kathi placed her name on the banner. This is not a LO, but it sure is a wonderful little piece of art, worthy of a spotlight this week. An inspiration for sure!! Beautiful tag Kathi. Lucky you to belong to such a wonderful group!! As I promised.....today is the reveal of my first Education Video using this months Technique Kit!! and ohhhhhh what a GLORIOUS kit it is!! This kit and others are available at Swirlydoos!! I am so honored (and nervous) to be apart of such a TALENTED group of ladies!! 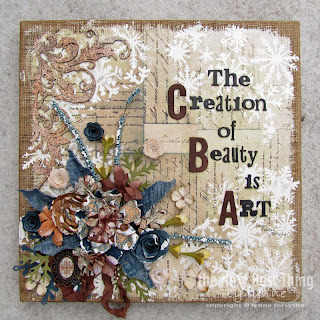 cause there is some A~MAZING inspiration to be had!! so without further adieu......the tag and tutorial!! !